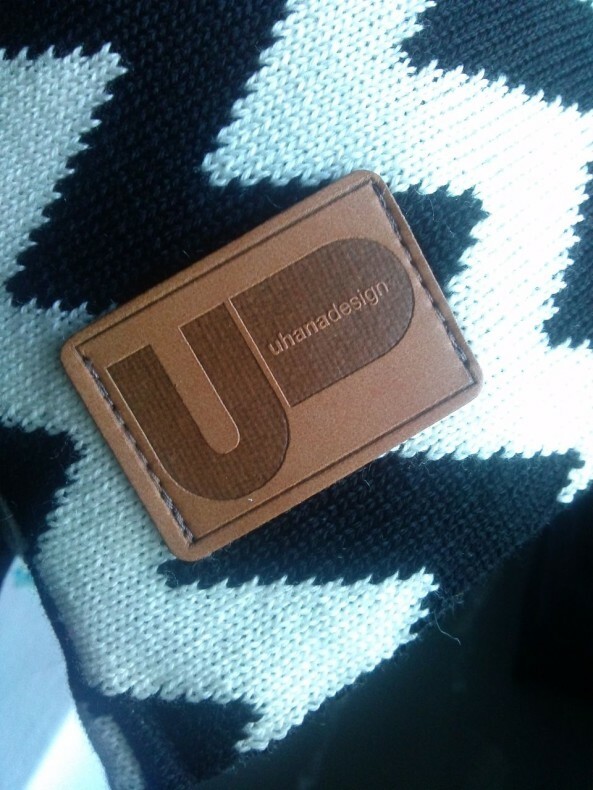 At the moment Uhana Design enjoys a fast growing popularity. With their imaginative, playful prints and high-quality fabrics, Mira Vanttaja and Hanna Virkamäki fight against the disposable culture. But how did these two women end up entrepreneurs? The founders of Uhana Design Mira Vanttaja and Hanna Virkamäki. Only a few minutes pass by with Mira and Hanna and it seems obvious. They share the cheerfulness, playfulness and the edges, which their label Uhana Design represent. At the moment there’s obviously a lot keeping these two busy like bees. 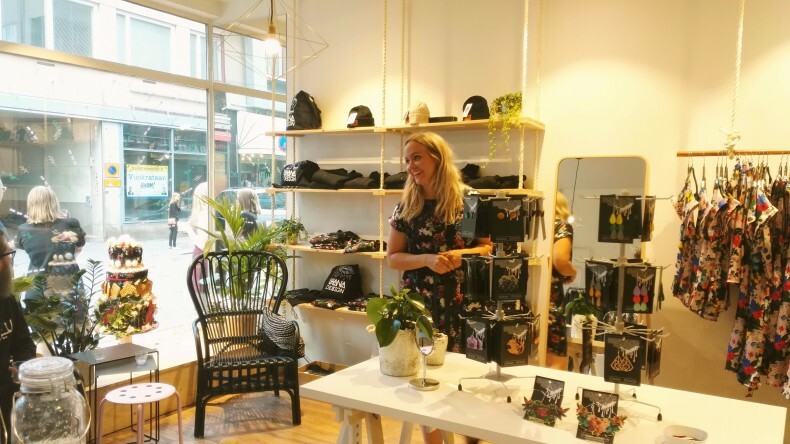 The new autumn collection, several pop-up shops, a big pre-sale in co-operation with Weecos and Neulomo, the next collection, rolling their own shop at Verkatehtaankatu, the famous to do -list is long! So when I ask about their leisure time they both burst into laughter. “This company is our work and leisure time,” they say from one mouth and glance at each other. The glue, which keeps Hanna and Mira together, is that they share the same values considering their business: they fight against the throwaway society and the disposable culture. In addition, they both are empathetic, honest and share a particular kind of kindness and perfectionism in everything they do. Mira states that their common intuition has led them this far. But let’s go a few years back and see how did these two end up together? Hanna at Uhanas shop at Verkatehtaankatu. The new collection has just been revealed. People, subcultures and clothes have always been Hanna’s passion. As a child, Hanna used to draw clothes and people. Not just a funny few but piles. She drew families and groups of friends, she dressed them up in various ways, imagined a whole world or story behind these characters, their age, interests and professions, everything. Her mother still treasures that pile of drawings. In addition to drawing, dancing, and especially modern dance, was the way Hanna expressed herself. She was part of a gymnastics team, they competed and performed a lot. Dancing took her to a drama emphasizing high school in Tampere. That period was wonderful but at the same time the competitive environment felt very stressing, she remembers. “Also at that point, I started to think what am I going to do with my life,” Hanna says. A profession related to clothes had been something Hanna’s mom had suggested during high school, but Hanna followed her other interest first and studied sociology at the University for few years. Although she enjoyed reading books, living the student life in Tampere, she missed, however, being creative. Hanna made a radical change, left the sociology studies and went to Ikaalinen to become an artisan. She describes herself as too precise as a pattern maker and sewer, but the years in Ikaalinen gave her a lot of understanding considering shapes and sizes, what does and what doesn’t look good on different body types. Hanna continued straight away to the University of Applied Sciences inHämeenlinna to be a designer. With some laughter in her voice, Mira admits that she has never been much of a handicraft-orientated person. She had numerous hobbies as she wanted to try everything from being a Scout to badminton. But most of all she loved art and drawing, enjoyed music and was interested in subcultures and dressing up. However, mainstream fashion wasn’t for her. It was actually her secondary school’s art teacher, who encouraged Mira to design, create and draw since she recommended her to become a designer. Graphic designing was something Mira herself had also thought, but then her friend suggested the Designer school in Hämeenlinna. She got in. 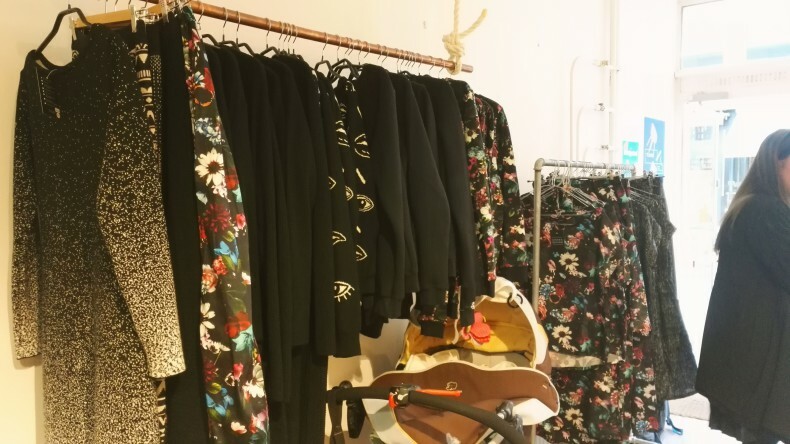 Clothes from AW 15/16 and AW 16/17 collections. The year was 2006. Mira and Hanna started at the same class and got along well, but they didn’t spend that much time together or attended even to the same classes due to Hanna’s previous education. Hanna remembers Mira’s party she was invited to and that memory makes them both laugh. Again. Years went by, and Hanna was on a maternity leave, Mira left to Shanghai China as an exchange student. Although it was just three months, it seems that Shanghai had an influence on how Mira thinks today. And actually to their playful prints as well. But we’ll get to that later! Mira describes the three months spent there as both unbelievable and quite a culture shock. The culture of copying and spying was strongly in the air, with a grin on her face Mira says that she wouldn’t be surprised if all the work students did there, went forward. “It was a fascinating experience, opened my eyes,” Mira laughs, “and I must say that I’m extremely happy for the Finnish environment, nature we have here. It was a terribly dirty city, and it was so great to come back and be able to breathe without a mask,” Mira explains her experience in Shanghai. During the yearlong break, Mira and Hanna had both time to think what they wanted to do in the future. The idea of entrepreneurship was bubbling in Hanna’s head and at their mutual minor-class she threw the idea in the air, but neither of them caught it then. Mira graduated in spring and Hanna in Autumn 2011 from the University of Applied Sciences as designers. During the summer Mira tried to find a job, but nothing suitable for here came up. She paid her rent by selling hand-made jewelry and thought about whether she had to move to Helsinki, and had time to re-think Hanna’s idea. At the same time questions considering fashion, ethics, and transparent production chains came up stronger than before for both. Mira kept asking herself whether she wanted to work for big businesses. After Hanna graduated, they seriously started to discuss a company together. Their individual strengths complemented each other. Hanna knew patterns, and she had excellent knowledge of the human body, the shapes of clothing. Mira’s created unique prints. They agreed that if they ever wanted to try entrepreneurship, the time was now or never. After the short break plans were clear and in November 2012, Uhana Design was founded. What do Mira and Hanna think of entrepreneurship, why nature is emphasized in Uhanas prints and what does Uhanas future look like? Find out tomorrow on our blog!